91 pages. 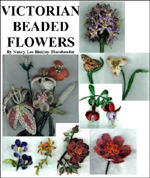 Patterns included in this book are Stargazer Lily, Pink Hellebore, California Wind Poppy, Rose Bud, Allium, Red Mariposa Lily, Butterfly Mariposa Lily, Fuchsia in Red and Purple, Johnny Jump-Up, Lucifer Crocosmia, Autumn Rose, Heron Peony. 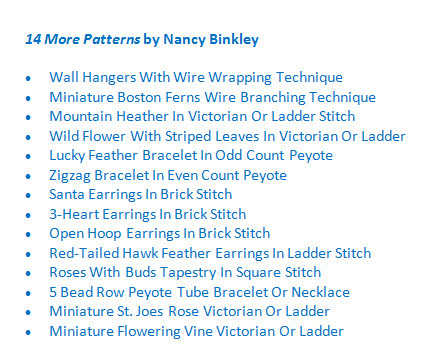 Nancy's patterns are easy to follow with diagrams, pictures and written instructions to help make this an experience that you will look forward to repeating over and over again. 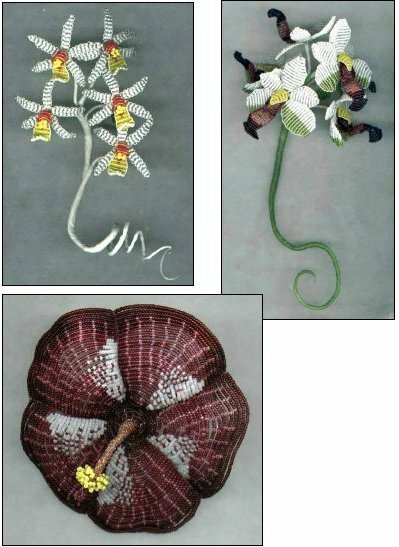 This book will be e-mailed within 48 hours. 95 pages. 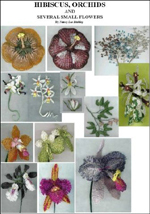 Patterns included in this book are Baby's Breath, Persian Lilac, Crocus Tournefortii, Bleeding Heart Vine, Coelogyne Ochracea Orchid, Happy Summer Orchid, Zuma Aussie Delight Orchid, Vanda Sanderiana 'Alba' Orchid, Hawaiian Fantasy (Jem) Orchid, Cattleya Pterodactyl, Dragons Breath, and Aztec Sun Hibiscus. 182 pages. 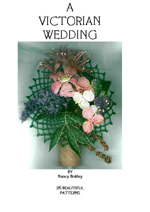 Beautiful Victorian technique wedding flowers with superb diagrams and instruction. Inlcuded are general instructions plus patterns for Bridal Crown & Tiara, Tussy Mussy Patterns, Lace Collars, Bride's Spring Lily, Rose Bud, Baby's Breath, Rose Queen Iris, Narine Bowdenii, Swamp Rose, Spider Wart, Lilac, White Dutch Iris, American Beauty Berry, Wake Robin Trillium, Blue Japanese Iris, Grand Iris, Little Pink Fuchsias, Yellow Mariposa, Stephanotis, Little Pink Orchids, Victorian Rose, Fairy Grass and Grooms Bloom. 60 pages. 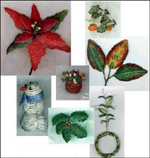 Patterns included in this book are Holly, Poinsettia, Fall Leaves, Miniature Corn Plant, Miniature Pumpkin Plant, Miniature Basket with flowers, asnd Miniature Snowman with carrot nose. 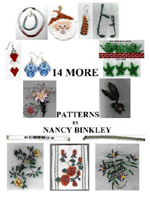 Nancy's patterns are easy to follow with diagrams, pictures and written instructions to help make this an experience that you will look forward to repeating over and over again. 82 pages. 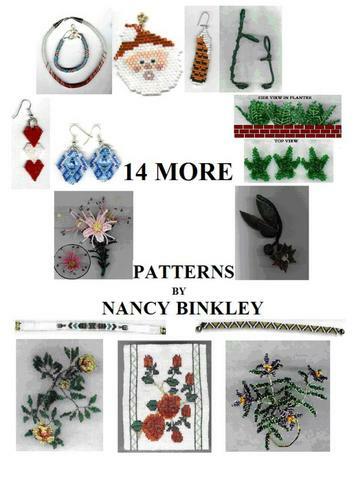 All of Nancy's patterns are learning patterns with complete instructions.